To be a buy-and-hold investor, one must be an optimist, trusting in the market’s upward direction and confident that, should there be a downturn, the recovery will be swift. While the active manager may believe in the long-term upward trend of the market, that belief is tempered by reality. The history of the financial markets is a tale of one financial meltdown after another, progressively becoming more expensive and damaging. 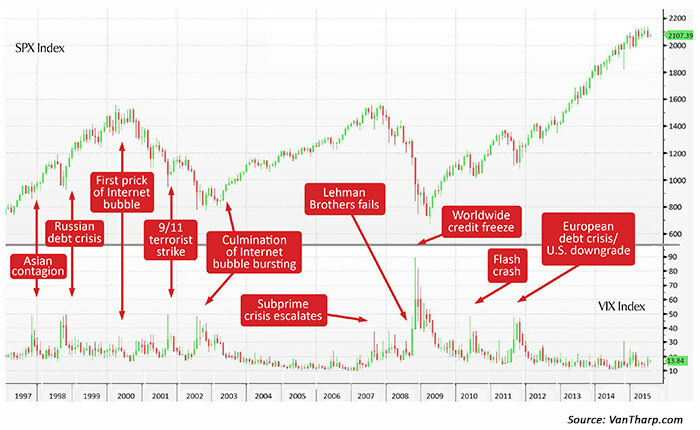 It’s easy to overlook how frequently these crises occur because their impacts are not always at the bear market level. But they still inflict extensive loss to investment portfolios, financial institutions, and governments. From 1950 to 1994, market historians can count at least 11 significant market “events,” beginning with the 1958 bond-carry trade collapse and ending with the Mexican debt crisis of 1994 (with the painful crash of ‘87 thrown in for good measure). Figure 1 highlights significant market disruptions since 1994. “We lurch from crisis to crisis.” For mathematician Benoît Mandelbrot, this was the sorrow of the financial world. Mandelbrot worked for IBM for 35 years, giving him access to the latest and most powerful computers. Working with computer graphics to create and display fractal geometric images, Mandelbrot may have been the closest yet to mathematically modeling financial markets. But his efforts reinforce the reality that financial crises are the norm—not the exception. Hyman Minsky, the mid-20th-century economist, also concluded that financial systems are inherently susceptible to bouts of speculation that, if they last long enough, end in crises. Rather than being models of efficiency, he maintained that financial markets have a tendency toward excess and upheaval. If one is to balance optimism with realism, active management becomes a crucial element of a prudent investment approach. Equity investments as an asset class have historically provided the greatest return—but at considerable volatility. This volatility often leads investors to buy stocks at market highs and sell at market lows, failing to realize much of the market’s power to create value. Managing volatility through active management helps investors stay the course. Active management enables investing more aggressively in favorable market conditions and taking less risk in uncertain markets. Equally important, active management has the potential to improve long-term investment results. By managing risk, active investment approaches enable investors to take a more aggressive approach to the financial markets by adjusting equity exposure in response to market trends. In a rising market trend, the portfolio may be 100% invested in equities (or more) to benefit from the market’s momentum, and vice versa in a down market. In comparison, the traditional approach of using a fixed allocation among non- or low-correlation asset classes to manage risk ensures that a significant portion of the portfolio is always underperforming, depressing overall returns. Any time investors can avoid losses, they gain leverage to benefit from bull markets. It comes back to the mathematics of losses and gains. It doesn’t take a 50% gain to recover from a 50% loss—it takes a 100% gain. 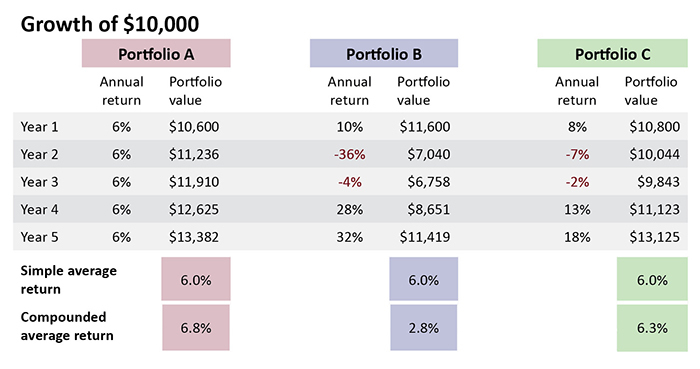 If an investment strategy can reduce the market’s occasional 30%-50% loss to a portfolio loss of 10% or less, then compounded returns can build significantly over time versus a buy-and-hold approach. It is troubling how often studies of market behavior use “average” annual returns to compare the performance of investment approaches, ignoring what financial author Hans Wagner has called “the dark side of compounding.” Wagner explains, “In the final analysis, one cannot spend average returns, one can only spend compounded returns.” As Figure 2 indicates, “slow and steady” return performance that avoids the impact of steep losses can lead to higher compounded returns over time. Active management enables the investment advisor (and his or her clients) to invest more aggressively in favorable market conditions and take less risk in uncertain market environments, in effect smoothing a portfolio’s growth trend and gaining the potential to outperform buy-and-hold investors over the long run. This requires identifying and taking advantage of market trends and implementing risk-management strategies to blunt the effects of the negative return scenarios. While hardly an easy challenge, the success of established active managers over the last 30 years has proven active management’s viability. Active management becomes particularly important as individuals enter retirement and begin withdrawing funds to meet expenses. In Figure 3, Portfolios A, B, and C are shown with and without an annual withdrawal rate of 4% in retirement. Steady withdrawals dramatically impact Portfolio B’s ability to recover from two down years (despite its two big winning years), while Portfolio C, which had less severe drawdowns, nears the value of the steady-return Portfolio A. The blind optimism of a buy-and-hold approach ignores the fact that history tells us that it is prudent and logical to expect negative market events to occur in the future, just as they always have. Active management cannot necessarily guarantee results, but it accepts this reality and moves away from unmanaged risk. And that is essential in a world where the future is unknown.